Chronic stress is inevitable in today’s time. Work, family, and finances, just to name a few, apply a tremendous amount of pressure on our everyday lives. This constant pressure leads to constant stress, something that can manifest itself emotionally, as well as physically. Rather than turn to prescription medications for help, one new study suggests cannabis might hold the key to alleviating one of chronic stress’ most unfortunate side effects. Stress affects every single person on a daily basis. Eventually, chronic stress becomes overwhelming, to the point it can cause noticeable changes to mentality or physical appearance. 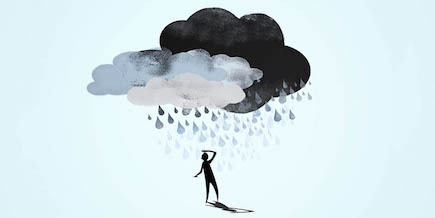 With prolonged exposure to the constant pressure and stress, depression can easily set in. While many suffer from depression due to a chemical imbalance in the brain, it can also be caused by the rigorous demands of everyday life. The endocannabinoid system, the part of our brain that is responsible for how we behave, feel, think and respond, is greatly affected by chronic stress. Over an extended period of time, chronic stress will interrupt the production of these important cannabinoids, leading to mood swings, breakdowns, and depression. Scientists at the University at Buffalo’s Research Institute were researching chronic stress and the endocannabinoid system when they noticed something unexpected. Scientists at the University at Buffalo’s Research Institute were researching chronic stress and the endocannabinoid system when they noticed something unexpected. We know that certain compounds in cannabis – THC and CBD – have the ability to mirror our own chemical responses found in the endocannabinoid system. However, scientists found that cannabis has the ability to combat depression specifically caused by chronic stress. THC and CBD can essentially replace the chemicals missing from an individual’s endocannabinoid system and act as a mood stabilizer, effectively erasing the depression. A 2007 study from McGill University suggested THC could be an effective anti-depressant in low doses. Researchers found that THC can raise serotonin levels in “depressed” mice in the same way as prescription SSRI’s, selective serotonin reuptake inhibitors. However, when the cannabis levels increased past a certain point, the effects were nullified. Despite being performed on mice, the research delivered astonishing information for the treatment of depression. Rather than consuming harsh prescription drugs like Prozac or Zoloft, which greatly alter brain functions with artificial compounds, those suffering from depression could simply consume cannabis. In states with medical cannabis laws, there are even specially formulated strains meant to specifically treat the symptoms of depression. Over time, we’re likely to see an increase in the research surrounding cannabis and mental health. It has already proven to relieve even the most debilitating cases of PTSD and anxiety, as well as reduce the risk for potentially serious side effects often found with routine treatment options. Combating depression is just one more benefit offered by the purest medication on the planet.